Among all the ways to get gas at home, one of them is through a propane tank. These tanks are particularly common and useful for households living in rural areas which aren’t connected to mains gas. Since these are a considerable investment to make, choosing and installing the right type requires to take an in-depth look at many factors. Below is a guide to propane cost, tank installation, and suppliers in France in 2019. Could a propane tank be right for me? While propane tanks can work very well in some types of housing and have definite advantages, they won't be compatible with all housing types. Find out more below. Depending on the size of your apartment or house, it will be more or less interesting to get a propane tank installed for your household. What energy should I choose to heat my house ? Which energy should I choose? Do you want to get more information and guidance about getting a propane tank installed? Call our English-speaking advisors at 09 87 67 37 93 or get a free callback (Monday - Friday 8am-9pm; Sat 9am-6pm) or request an estimate (in French). If propane seems to be the appropriate energy for your housing, before you go ahead to purchase and commit to a propane tank, there are a few additional factors, both positive and negative, to consider. A big advantage to propane is that it can be delivered anywhere across France, even to isolated and cut-off areas. It is thus a great option for households living in mountain regions, in the countryside and for big family homes in rural areas. It is a relatively safe energy source, as it is non-toxic, and does not emit much smoke. It can keep functioning in very extreme sub-zero temperatures, down to -44ºC. A propane tank installation can benefit from a reduced VAT rate and is eligible to an energy tax credit (CITE). This said, propane is not a renewable source of energy, and it is estimated that propane supplies are limited to a few decades only. It is also an imposing structure and not the most aesthetic (you can however decide to bury it underground but this means further costs and works) and requires to have sufficient outdoor space to stock it. Households that are already connected to mains gas need to stick to this source of energy and will not be able to switch to a tank. Having a propane tank installed at home is a pretty hefty investment, so it is important to select your provider and offer cautiously. Find out all about the tariffs and steps to follow to install a tank below. The quantities shipped - obviously the higher the volume of propane purchased, the higher the price. The various promotions that propane suppliers can issue at the beginning of a contract. This can enable prices to be fixed for set periods of time (1 to 3 years for instance) and protect the customers from potential propane price rises. To compare prices, request an estimate for propane gas (in French), call our English-speaking customer service line at 09 87 67 37 93 or get a free callback (Monday to Friday). In France, you have a choice of 5 main propane suppliers: Antargaz, Butagaz, Finagaz, Primagaz, and Vitogaz. As shown above, Antargaz and Finagaz are the cheapest on the market at the time of writing (excluding promotions and prices of subscriptions and added-on services). It is well worth getting quotes from several providers, comparing their tariffs and seeing how much these can be negotiated. Although a discount on prices can be agreed upon,some rates cannot be negotiated - namely, the price of transport which is solely dependent on the distance between your home and the distribution centre. Be very cautious of the exclusivity clauses set by the various suppliers. Indeed, some contracts will tie you to their services for long times stated above. A benefit of this is that the duration of a contract can have a strong impact on tariffs, and longer contracts can significantly reduce how much you’ll pay each month. However, over this exclusivity period (typically 1 to 9 years), the downside of this is that the customer is bound to the supplier and can only be supplied by this company (a padlock may be installed on the tank to ensure this). So be careful to look at how long this clause is, and whether you are sure to need propane in your home for the whole duration. Also note that you won’t be able to move home, change your contract (even if you are unhappy with the provider and its service) or renegotiate prices over the exclusivity period, unless you are ready to pay hefty early cancellations fees. So, while signing on for 9 years may sound like a very attractive option, make sure it’s going to definitely fit with your situation, now and in the years to come. 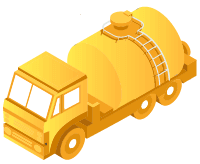 Buying your own tank, which means you will be able to choose your supplier freely without being tied down to long contracts, and will pay less for propane gas. Just bare in mind that a tank costs on average around €1,000 to €2,000 depending on the type of tank you want (underground tanks are usually more expensive). You will need to find a supplier willing to provide you with the tank and install it for you at a reasonable price. Renting out a tank and paying a supplement for it, via a subscription or though your monthly propane bills. Paying an upfront deposit, which will be returned to you at the end of your contract period. Generally speaking, suppliers prefer to encourage their clients to rent out a tank rather than buying one, as this makes it easier for them to build loyalty and get them to subscribe to a longer and exclusive contract. If you decide to rent a tank, you will need to first contact an agent from your chosen provider, who will come to your home and determine whether it is indeed possible to install a tank where you live. You will then sign the exclusivity clause which binds you to the provider to supply you and install your device. Tanks can work in all sorts of areas - cobbly, steep, muddy, rocky… They can be adapted to function in many environments. They can be buried or fixed overground, it’s up to you. They can work in extreme temperature conditions - there are no risks of the gas freezing. However, a French regulation sets a minimum distance between your tank and your home, as well as between your tank and your neighbour’s home. Self-checking: in this case, it’s up to you to supervise you tank’s level and to call your supplier once it goes down to 20% of its capacity. Automatic deliveries: in this case, the provider will calculate how much you need based on your annual consumption (taking weather conditions into account). You will then be delivered supplies automatically. This option is highly recommended and gives you a total peace of mind, as you won’t have to fear ever running out! You can then pay for your deliveries either per delivery, or on a monthly basis during 10 months, after which the cost will be adjusted according to the actual number of deliveries that occurred over that payment. You can pay via direct debit, cheque or documentary collection. 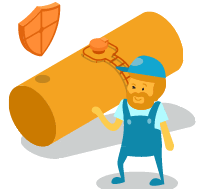 Tanks are pretty low maintenance, and their servicing is left up to your propane provider. Indeed, every time a technician comes around to deliver gas to you, their job is also to monitor the state of your tank and check for any defaults. Note that it is also mandatory in France to carry out an in-depth control of your tank every 3 years. Propane and safety Propane gas is non-toxic, and its combustion does not create any dangerous emissions. As it is odourless, a smell is artificially added to it, so as to detect any potential leaks. However, propane remains highly flammable and it is thus crucial to carry out the safety checks regularly to prevent explosions or fires. There are 5 main suppliers to choose from in France - find out more about them and how to switch from one to another. 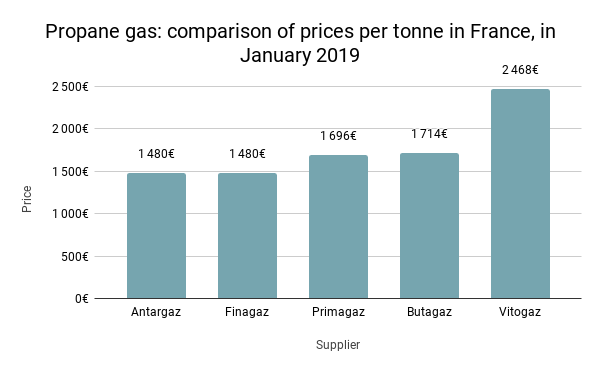 The propane gas market is structured similarly to an oligopoly in France, with Antargaz, Butagaz, Primagaz, Vitogaz and Finagaz providing 90% of contracts for gas tanks and propane bottles sold in the country. Because of this, prices remain fairly high and competition is maintained low. What’s more entry barriers are very strong, since any new actor on the market would need access to propane in very high quantities, and have the means to operate on a national level. This explains why smaller and independent propane suppliers are dying out today. Butagaz: the French leader in propane supply, with a low price policy, a variety of propane solutions and offers a very good presence nationwide. The company now also offers natural gas and electricity. Antargaz: a historical French provider, which offers propane and natural gas to individuals and professionals). Primagaz: also a historical player in the sector, which puts emphasis on transparency by disclosing its price lists online. Finagaz: formerly Totalgaz and a subsidiary of the Total group. It offers its tailor-made delas for propane, but discloses only very little detail online. Vitogaz: the smallest of the 5 major propane players in France, with a partial coverage of the territory and greater market share for the sale of LPG fuel than in propane tanks. It is possible to change propane supplier even if you are still tied to a contract, although this will come at a cost. Cancellation fees will decrease overtime, so the longer you have been tied to a contract, the less you will pay to get out of it. In some cases, it may even be possible to negotiate with your new provider for them to refund your cancellation costs to your former supplier. Below is a comparison of these fees per provider. For more information about propane providers and finding the offer right for you, call our English-speaking advisors at 09 87 67 37 93 or get a free callback (Monday - Friday 8am-9pm; Sat 9am-6pm) or request an estimate (in French). French propane contracts and bills can be quite difficult to decipher if French is not your mother tongue. Here are a few tips to help you understanding these. So, you receive a propane bill. It might look a little complicated at first, but once you understand its structure and all the differents fees that compose it, it will be much clearer. The first element concerns the price of propane gas itself, calculated in €/tonne for the delivery. If the contract includes the installation of a gas meter on the outside of the gas tank, the total charged will be that of the amount of kWh of gas consumed, not that of the amount of tonnes of gas delivered. The following elements may be added to the total price: fees for the method of payment used (if paying with other means than direct debit), staggered payment of the gas bill, transport fees in case of a failed delivery, etc. The gas bill also then includes costs related to the price of the gas tank and tank maintenance: commissioning, installation, removal, relocation, neutralization, technical control, decadal requalification, pumping... These fees are paid by the customer in the form of a monthly subscription, or a deposit.